The Government of Indonesia is now protecting the world’s largest ray species, the giant and reef manta rays, from fishing and trade. 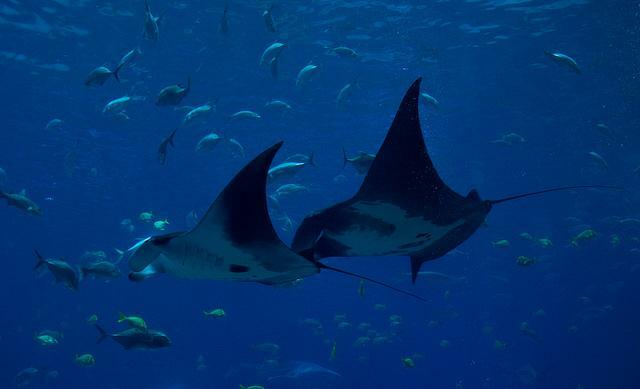 This new law represents a major advancement in efforts to conserve manta rays, which in 2013 were added to the list of species regulated under of CITES (the Convention on International Trade in Endangered Species of Wild Fauna and Flora). As of September 2014, all 178 CITES member countries will need to control trade and implement other CITES trade rules for these and several heavily traded shark species to ensure that international trade is not a threat to their survival. Among the world’s largest fishes, manta rays have ‘wingspans’ that can exceed seven metres. They also have one of the highest brain-to-body ratios of all living fishes. They can reach the age of 20 to 30 years old, they mature late, and they give birth to generally a single pup every two years after a gestation period of one year. Manta rays are among the least productive of fishes and, thus, exceptionally vulnerable to overfishing. International market demand for these fishes’ gill rakers (minute, finger-like structures that enable rays to filter zooplankton from water), which are traded for use in an increasingly popular Asian health tonic, has driven dramatic increases in largely unregulated fisheries for manta rays, and depleted their numbers at numerous sites. Both species are classified as ‘vulnerable’ according to the IUCN Red List of Threatened Species. Although mantas have been commercially fished in Indonesia, they are far more important economically in the country’s dive tourism industry. Recent reviews of the tourism value of manta rays have provided irrefutable evidence that these animals are worth far more alive than dead, with a single animal estimated to generate from $100,000 to as much as $1.9 million in dive tourism revenue over its lifetime, as compared with as little as $200 paid for a dead manta at a fish landing site.